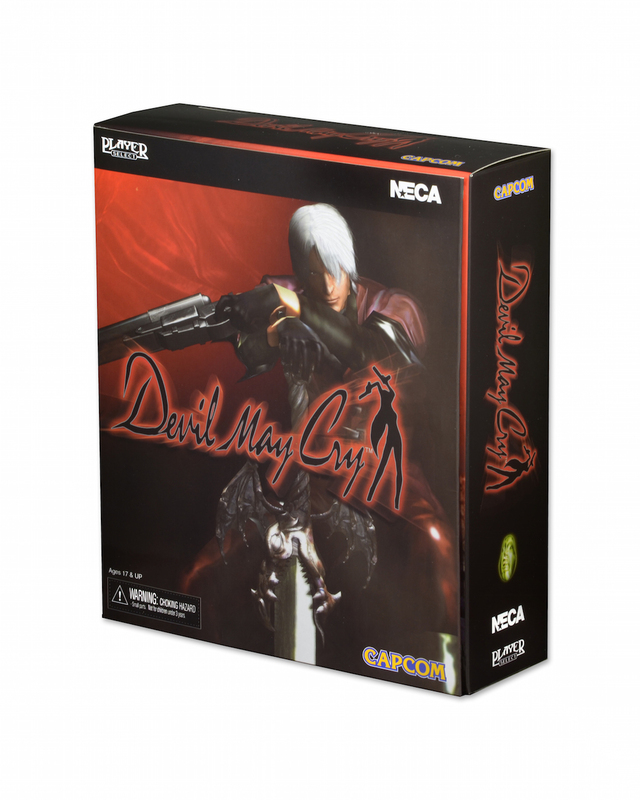 During our coverage of NECA’s Video Game Display at New York Comic-Con 2014, they premiered an awesome new Dante figure from Capcom’s Devil May Cry Video Game Series. We now have a few new official photos and some info on the figure. 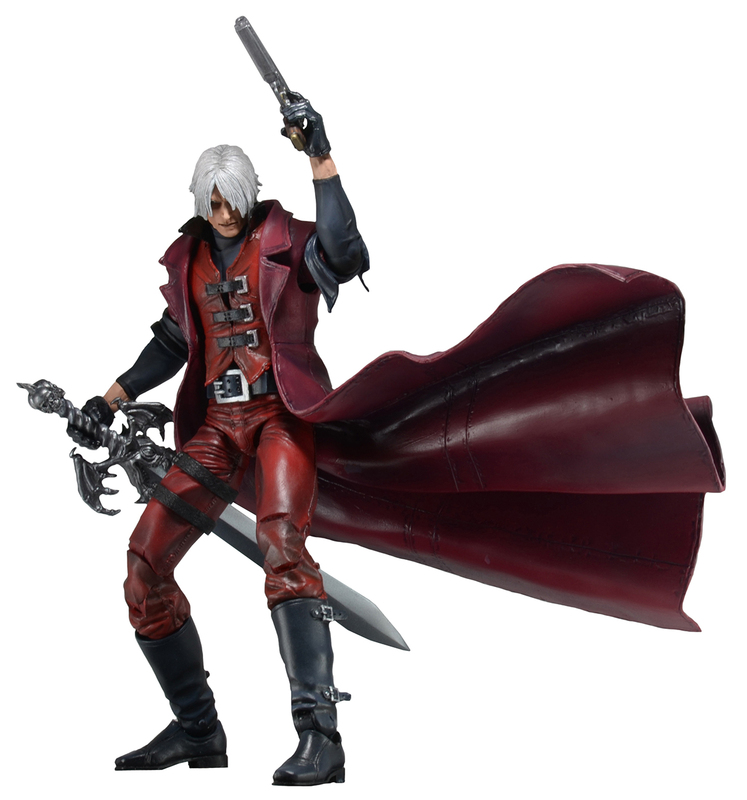 NECA‘s update shows that Dante will be roughly 7″ tall. The figure will feature over 35 points of articulation. The figure will come with his iconic pistols; Ebony and Ivory. He will also include his sword Alastor, a shotgun and some swappable hands. 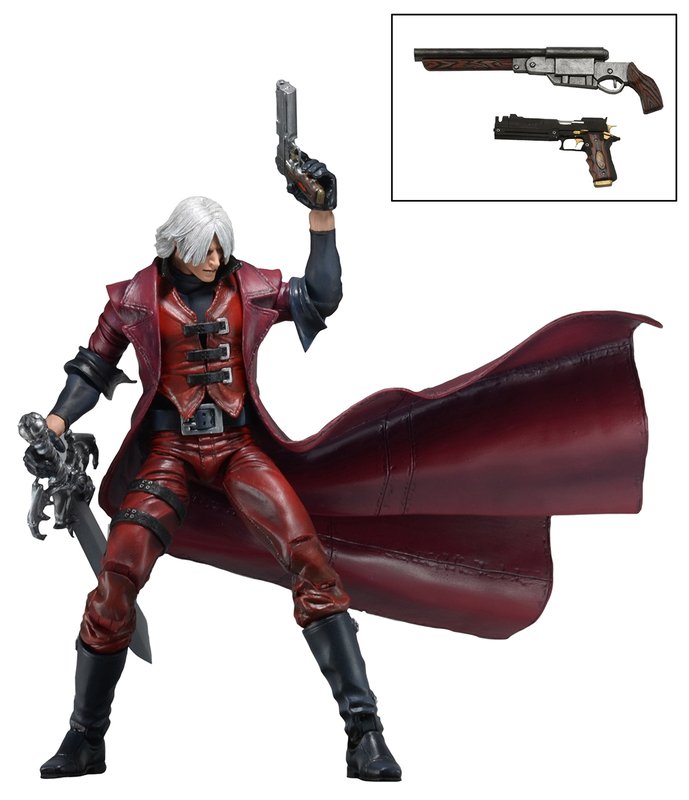 Though not pictured, they reveal that Dante will come in a flapped window box similar to their NES style figure, which will recreate the look of the original video game packaging. Look for the figure to be released in March 2015. 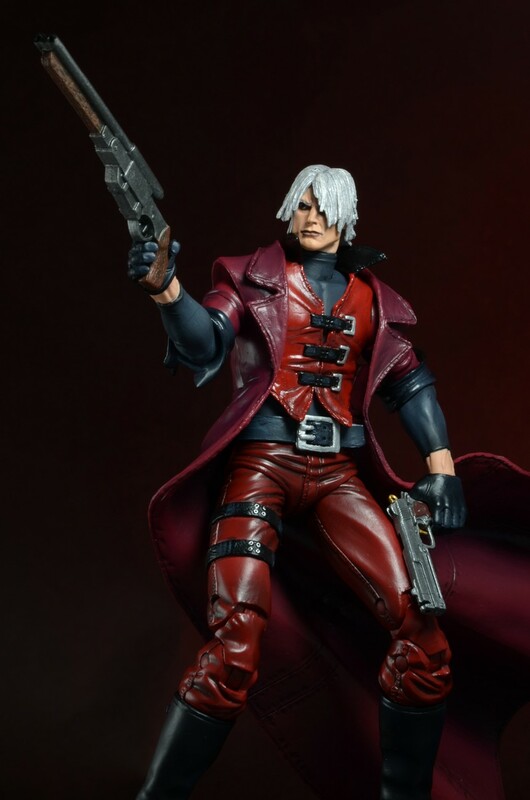 Dante will be limited to just a single production run. Read on to see a few new photos. Who-A!! This fig looks glorious. I'll pick it up for sure!! Good to see Neca is still doing Capcom characters, maybe they could revisit the Resident Evil cast. I missed out the first time, & they're going for an indecent price on ebay now. Now this will get pre-ordered. NECA products like this are really hard to find at TRU, so I'm not going to risk missing this. 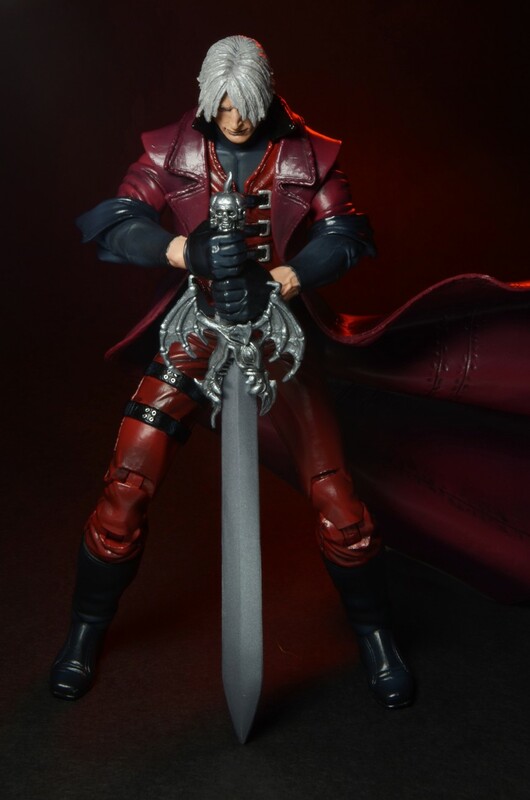 Hopefully it's of better quality that PlayArts Dante was. Hope I can find one or two before it's sold out, it looks awesome. And I've missed wielding Alastor. A sword with lighting powers is just too awesome. Totally buying this. It looks great. I am VERY excited that this figure is finally being released ! 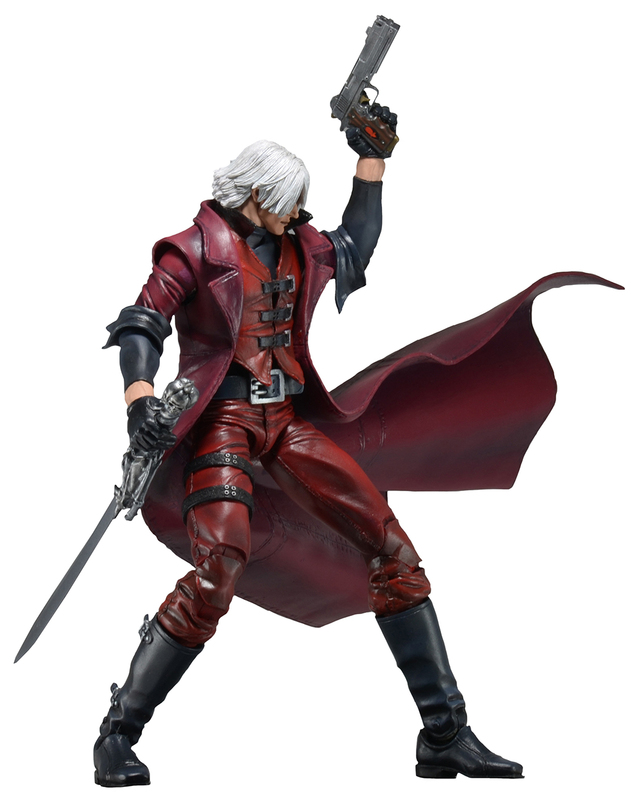 Now, if we could get figures of Vergil, Trish, Lady, and Nero, I would be ecstatic. This is probably not gonna launch a new series of figures, this is really just a one-off ultimate figure release just like the ultimate Leatherface probably won't start a series for that. I miss the days when NECA would release entire lines based on game franchises, like their God of War and Street Fighter IV figures. A figure of Lady along the same lines as Dante would be bought on sight. It seems to me that the market is there, but it is also being overestimated. Bioshock Infinite got some great figures but in the long run the support just wasn't there, which really ticks me off in that case because I wanted them to make another Elizabeth. The support was strong enough for the Gears of War franchise to get stuff for every game but even if a new entry were revealed it still wouldn't guarantee a strong environment for toys. While I'd love to pick this one up, availability will be an issue with only one production run. That, and I'm not too sure about the trenchcoat being molded in that position. Works great for certain poses; not so much for others. I think it will have to be an impulse purchase if I happen to find it on the pegs/shelf and I've got the cash on me. Too many other things on my plate atm. It seems like I've been waiting for this figure for YEARS. I think I remember hearing about it in the late 2000's. I wanted a Zoey from the L4D line, but by starting the line with the boomer they killed it before it really began. The boomer didn't sell well at all so the retailers killed the line once the smoker came out, which sold a lot better than the boomer but not enough to save the line.